This colt was foaled January 23, 2019, at GreenMount Farm, and is a Maryland-bred by the Grade 1-winning millionaire Imagining, who is from one of the most productive stallion families in Maryland history and has his first runners in 2019, out of Tuxedo Annie, a winning daughter of the Phipps-bred stakes winner Polish Treaty. Polish Treaty’s dam was the stakes winner Infinite, she in turn out of Clear Ceiling and thus a half to classic winner Quick As Lightning and to Pure Profit, the dam of Inside Information and Educated Risk — so this colt has deep Phipps families on both top and bottom of his pedigree. 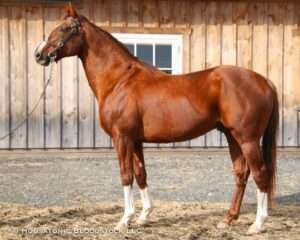 He will be raised at GreenMount, since his dam is being bred back to the exciting young Maryland stallion Blofeld in a Housatonic Recommended Mating that you can read about here. You can read why we planned the mating that produced this colt here, and check out more photos of him here.